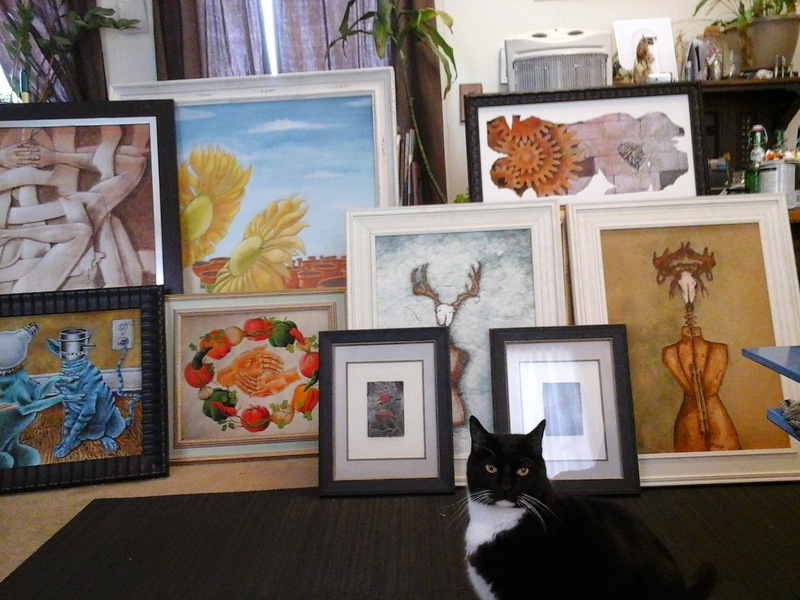 My house is pretty minimally hung with art. Sometimes when I have been working all day in the studio, the last thing I want to look at is a complex piece of art. I love anything that comes from the natural world. 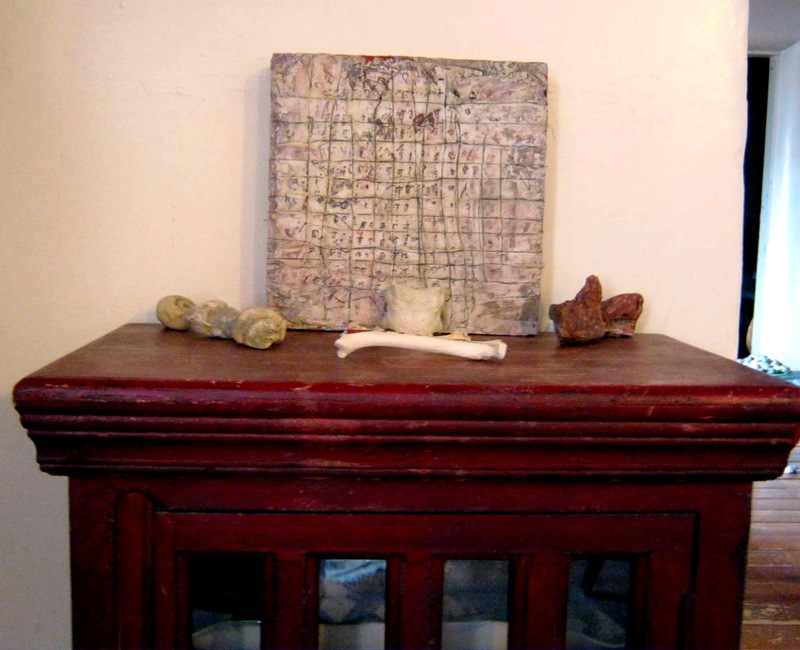 Here with my painting I have fossils, rocks and bones collected on my hikes here in Taos, NM. This little corner of our living room says a lot about who we are. I created the two abstract mixed media paintings on the right which reveal the combination of my sense of feeling alive as well as my need for calm. The piece hanging on the left is a saying from the Torah which means "no person shall be alone." Seeing this daily reminds me how grateful I am for the constant love that surrounds me. I live in an Eichler home, which means that many of the walls are actually glass sliding doors. Not much space to hang art BUT there is lots of natural light! I painted one of the few walls in periwinkle blue. This is a great color for art in white frames. 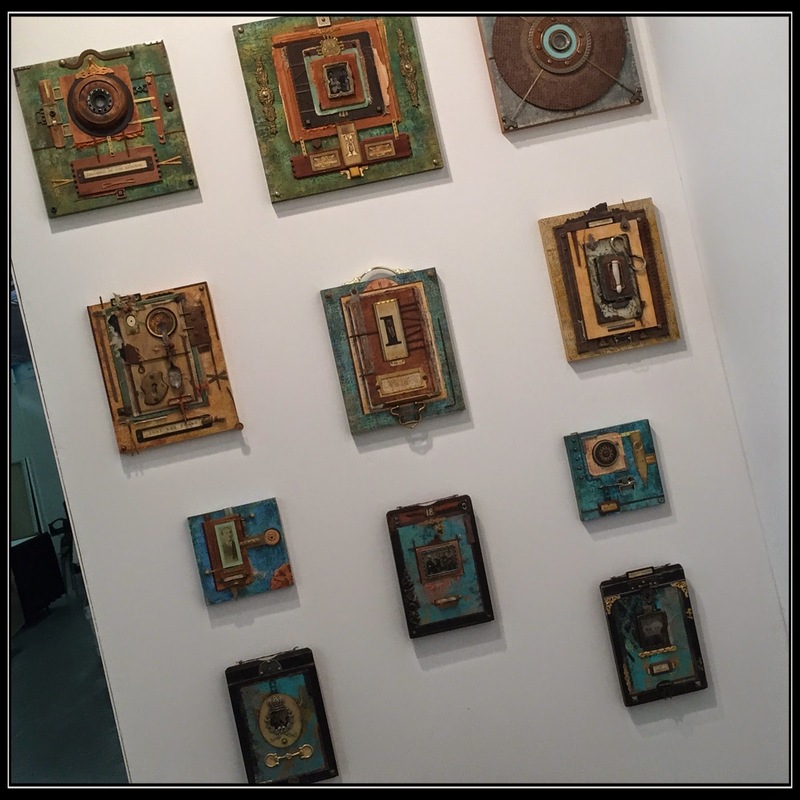 These pieces were created in different times of my life and they are part of my eclectic collection of art and fun objects. This is my art in my studio/living space. 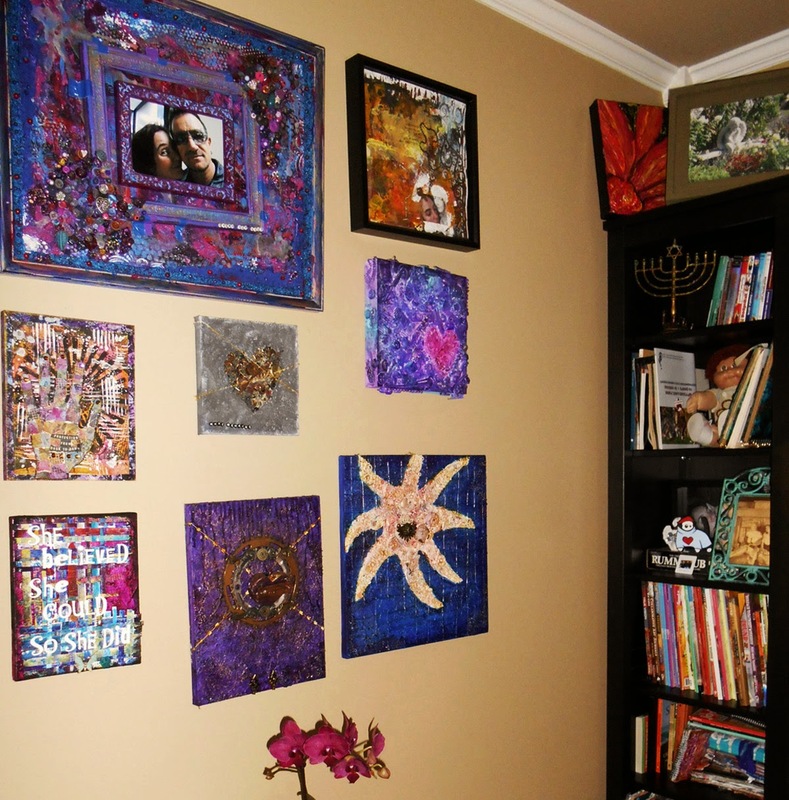 Most of the art on the walls is art quilts I made between 2009 and 2012. 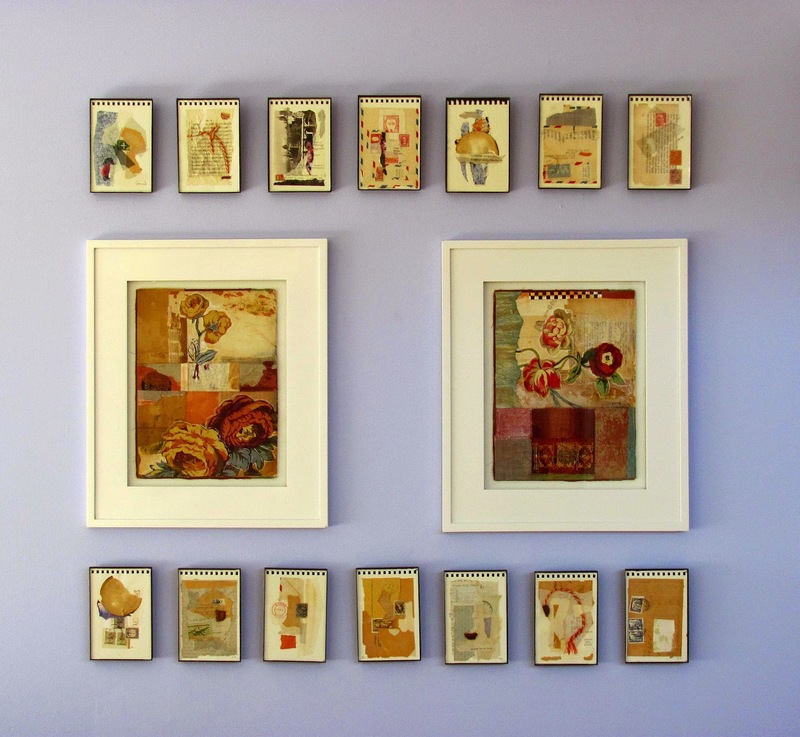 But there are also a few small pieces, painted and/or collage, which is what I am doing these days. Plus the needlepoint I did in the 1970s. 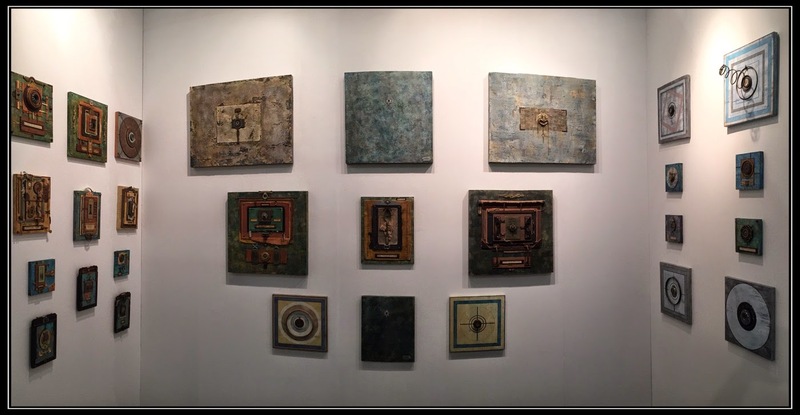 The Pulse Project - an exhibition of more than 100 pieces of art from 29 artists who contributed to my books (The Pulse of Mixed Media and The Mixed-Media Artist) is winding down. 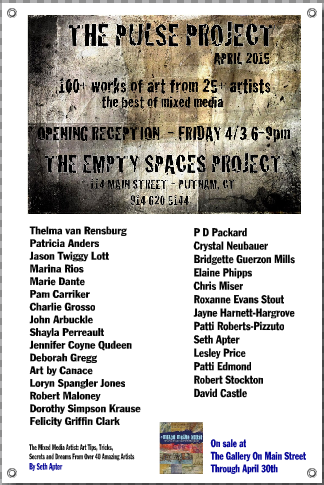 It has been on exhibition at The Empty Spaces Project gallery in Putnam, Connecticut for the month of April but must make way for a new gallery event for May. All work is also posted online here. 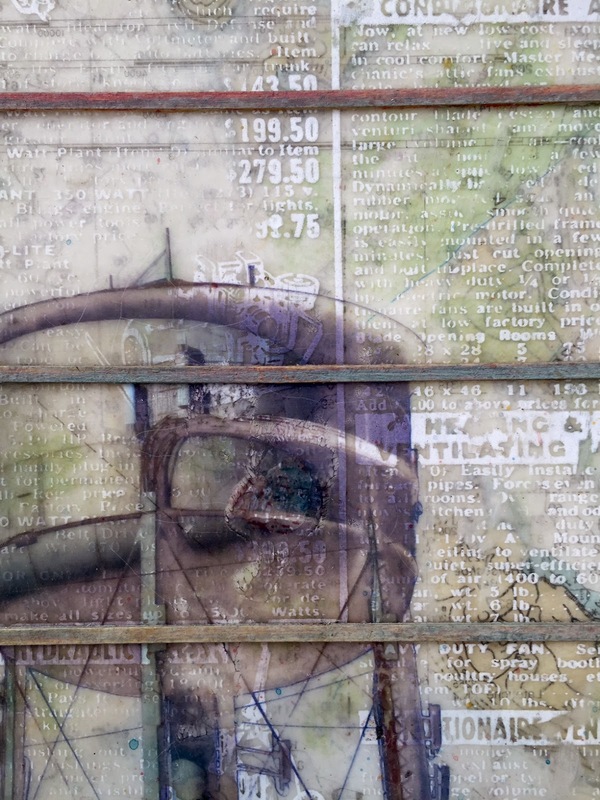 Your last chance to see and/or purchase work from the online exhibition is this Wednesday, April 29. Thank you so very much to the artists who contributing work to this show, some of which can be seen in this local newspaper feature. Thanks also to those of you who have taken the time to see the work, either in person or online. And a big thank you to Paul Toussaint and Ann Monteiro from the gallery for making this happen! Loving the Fragmenta series from Micaela Lattanzio where she constructs and deconstructs for a new perspective of an image. Found on Design Milk. Big love for this mini book from Roxanne Coble. Love the photography of Hebe Robinson. Unique and compelling. Found on I Need a Guide. 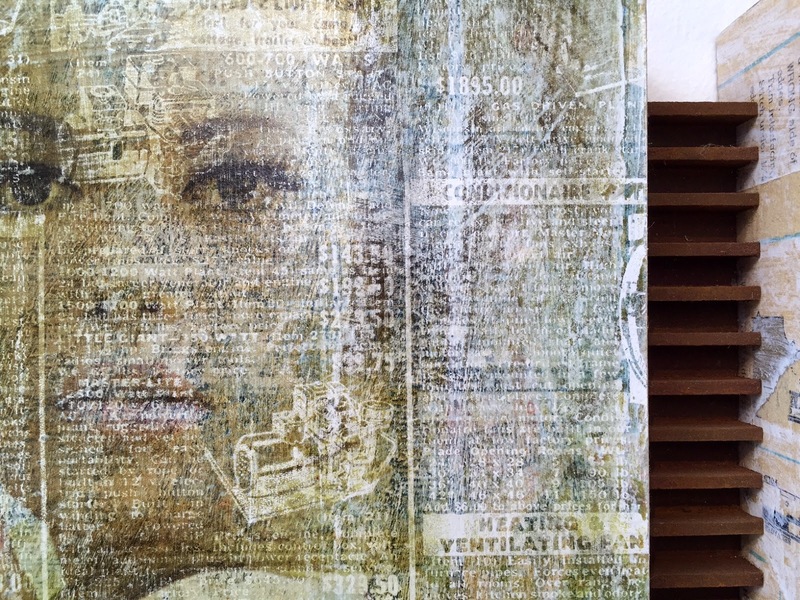 Art journal flip through from Martice Smith II. 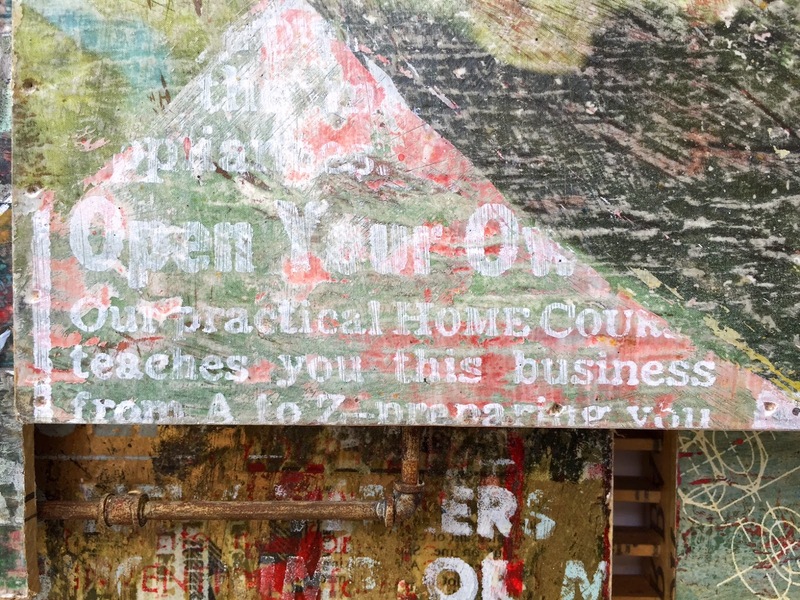 Powerful post from Elsa Mora about reconnecting to you creativity. Worth the read even if you are already connected. 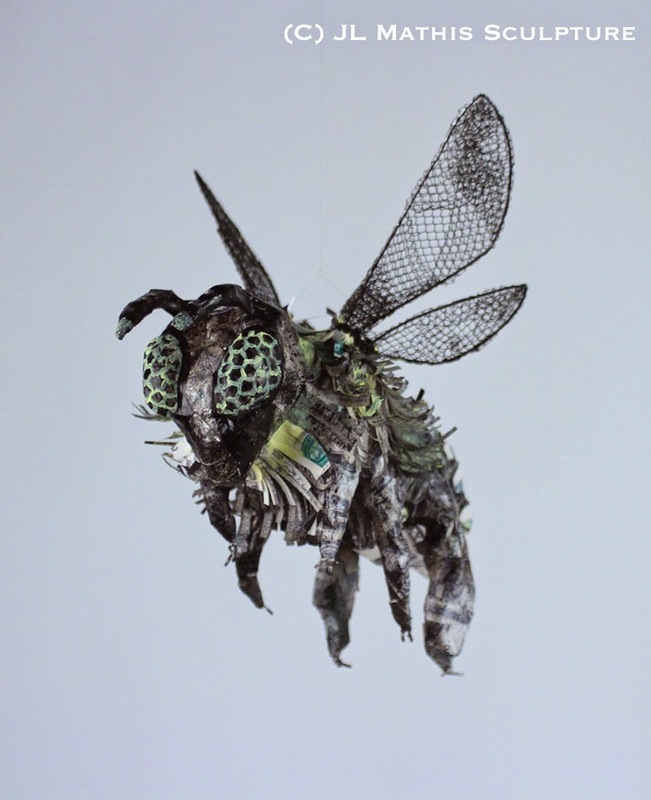 You won't believe what Joanne Tinker does with foil wrappers. Blog Trends: Should you rebrand and redesign your blog? From Holly Becker at Decor8. My column - The Creative Pulse - in the new May/June 2015 issue of Cloth Paper Scissors is all about collaboration. 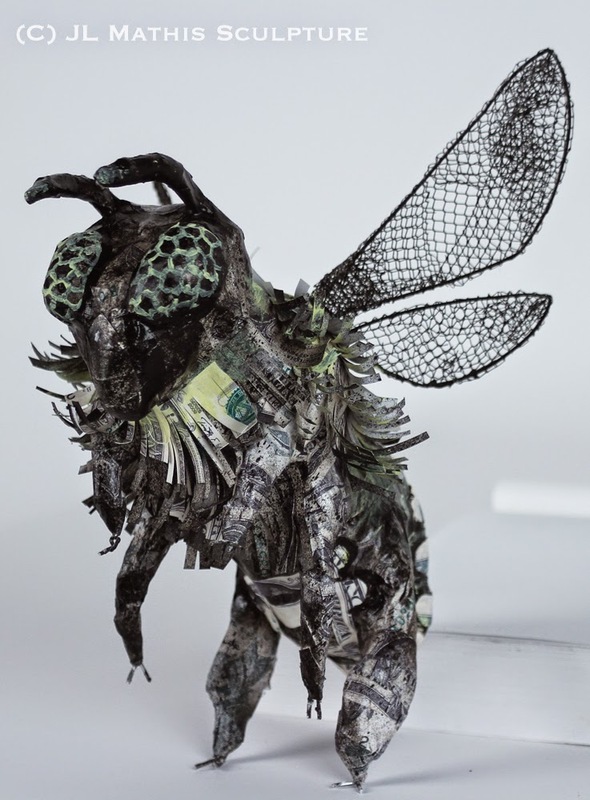 In it you will find tips to get a collaborative art project started -- and finished, a list of basics to organize your collaboration, some opportunities that can come from such a project, and many pictures of collaborations I have worked on. And speaking of, there is a Collaborations tab at the top of this blog that will take you to a page that highlights many of the collaborative projects I have been involved with. My studio is anything but minimalist. 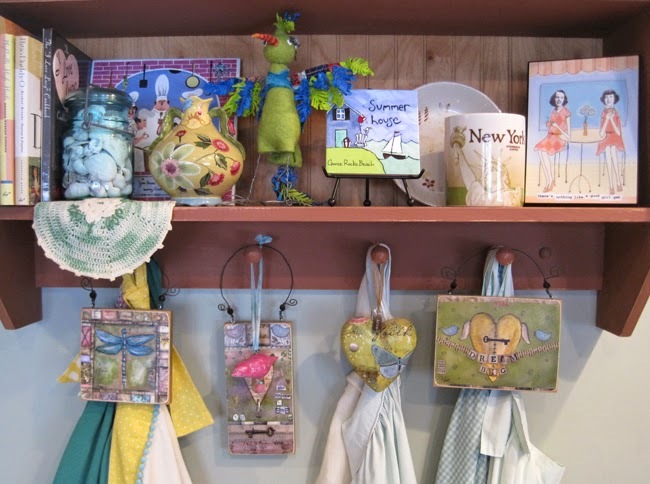 As a counterpoint, the spaces my husband and I share are intentionally uncluttered. Our house was built in 1958 and we've kept the mid-century modern feel. 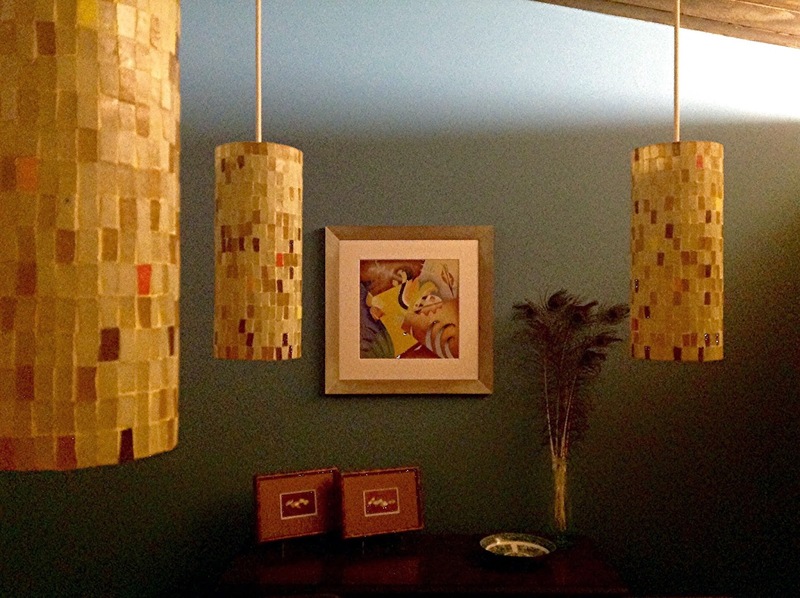 The original pieced glass light fixture casts a soft glow on the three pieces of art in the room - an abstract airbrush painted by my father from his college days and two small watercolors of peanuts by my mother, whose work was always realistic. I can see my own hard-edge graphic style in my dad's work, my love of deep rich colors in my mom's. We love the paintings for how they look, but even more for all the memories they hold. Young and poor my first savings were spent on a great lythograph (now hanging on my kitchen wall). 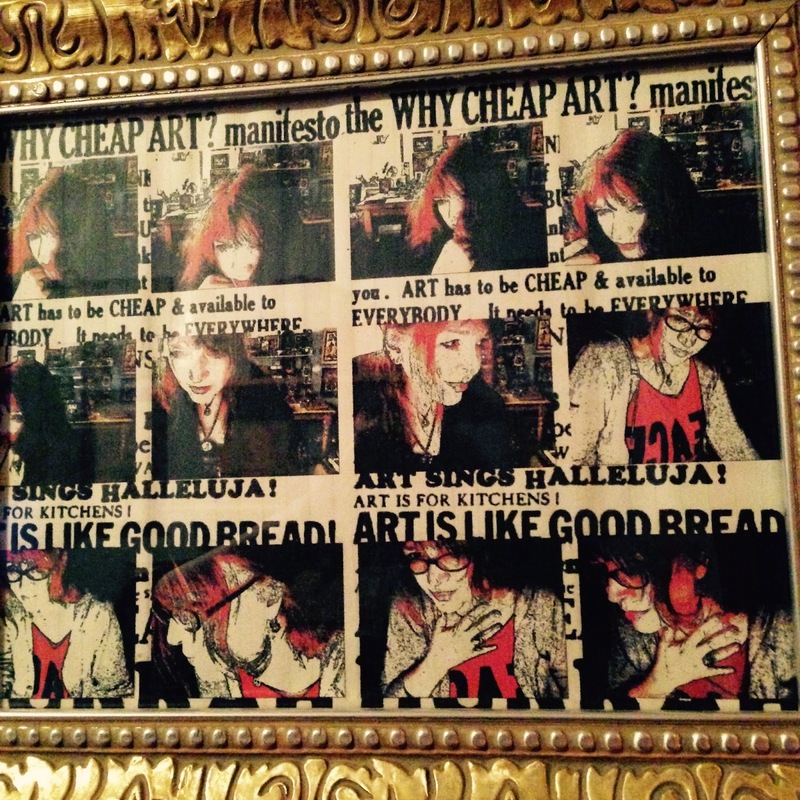 Old and still poor (in money) my house is filled with art, given to me, bought by me, made by me. A house without art can never be a home to me. I live near the beach and have a passion for boats. Before I became disabled I loved going the docks and taking pictures to work from. I painted the boat painting and the little encaustic, as well as a couple of small angel collages sitting in one of the boats and the girl statue sitting near that. It is cool that I am into boats because then out decor has a masculine feeling to it so my husband is not overwhelmed by too many girlie items. I am totally surrounded by art. It fills my senses and inspires creativity. 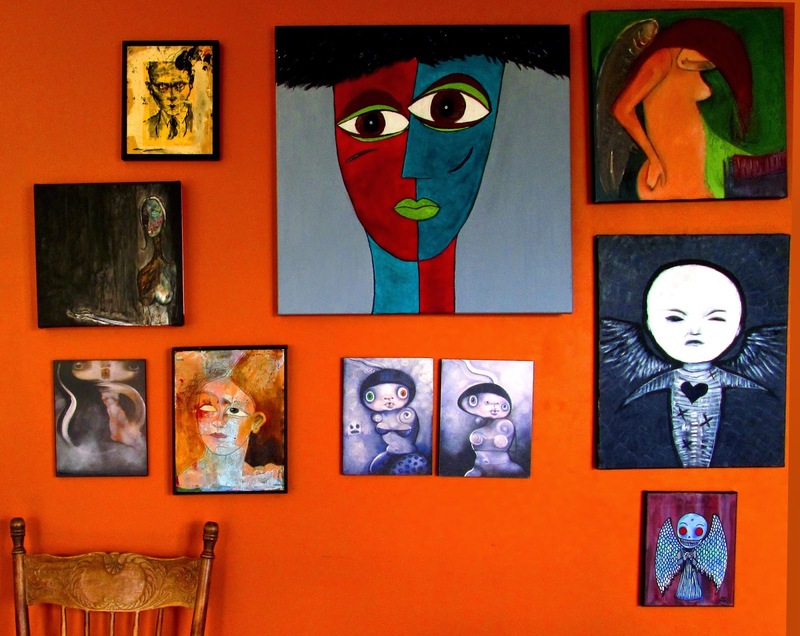 I have many walls of art, either other artists, collections, my art or items I enjoy. 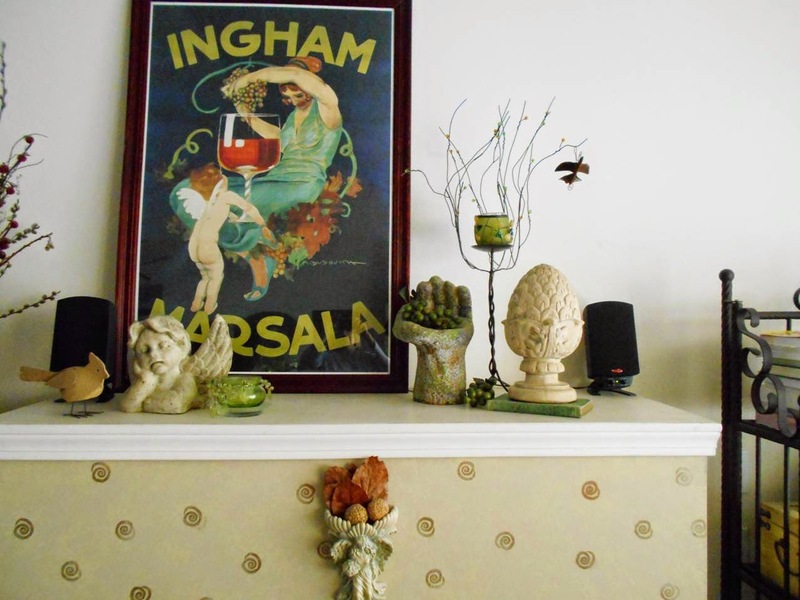 Above my fireplace is this vignette. I sit across from this every morning and never tire of the view. You'll find birds in any way, shape or form around my house and they make their way into several pieces of my art. Hands, faces and the color green seem to be a consistent theme as well. This is one of several assemblages that around my home that provides inspiration and comfort. Living with art is not only a choice, it is a necessity for me. 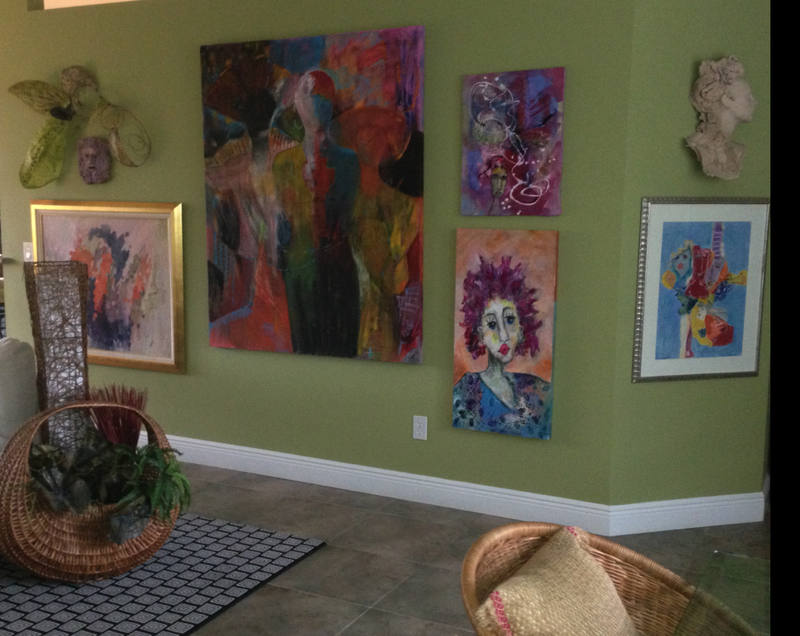 In my artwork and in my home I am influenced by many cultures. That is why I call myself an international artist. My works in my living room are sacred meditative works that reflect the Apache Creation Story. The story is about Changing Lady and the Sacred Mountain Spirits. I want everyone to remember their divine origins no matter what it is for them. 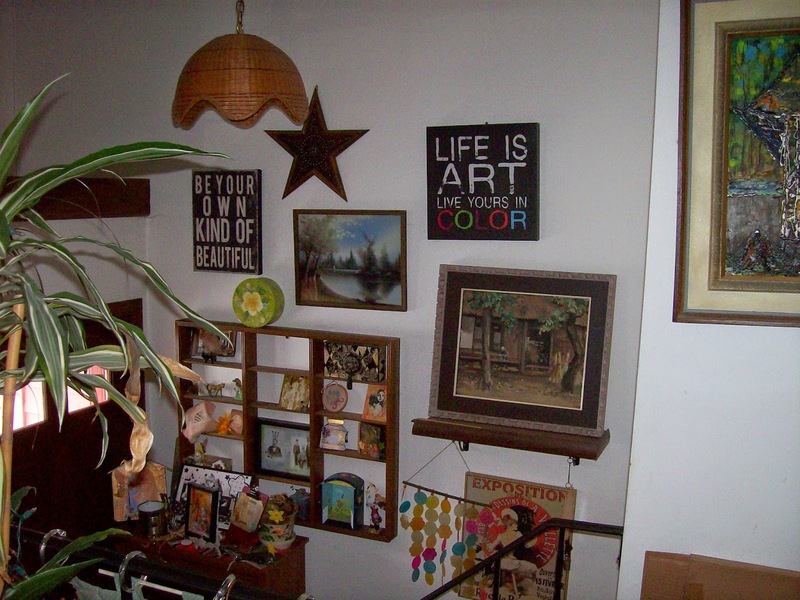 I am an artist but also a collector and have been collecting art for over 40 years. I buy from artists that I know as well as unknowns, thrift shop finds, trades, as well as my own work. I can't live without my walls filled with these treasures and can tell you how I acquired each and every one. I built my home to work around my art and from time to time change things around to get a new look. 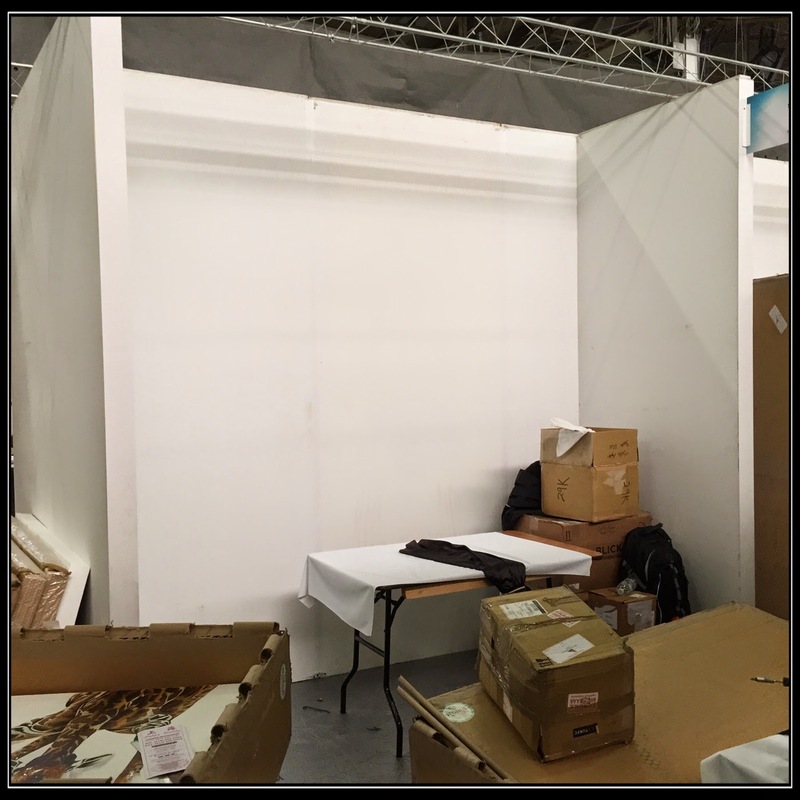 I spent the day today setting up my booth for ArtExpo New York. 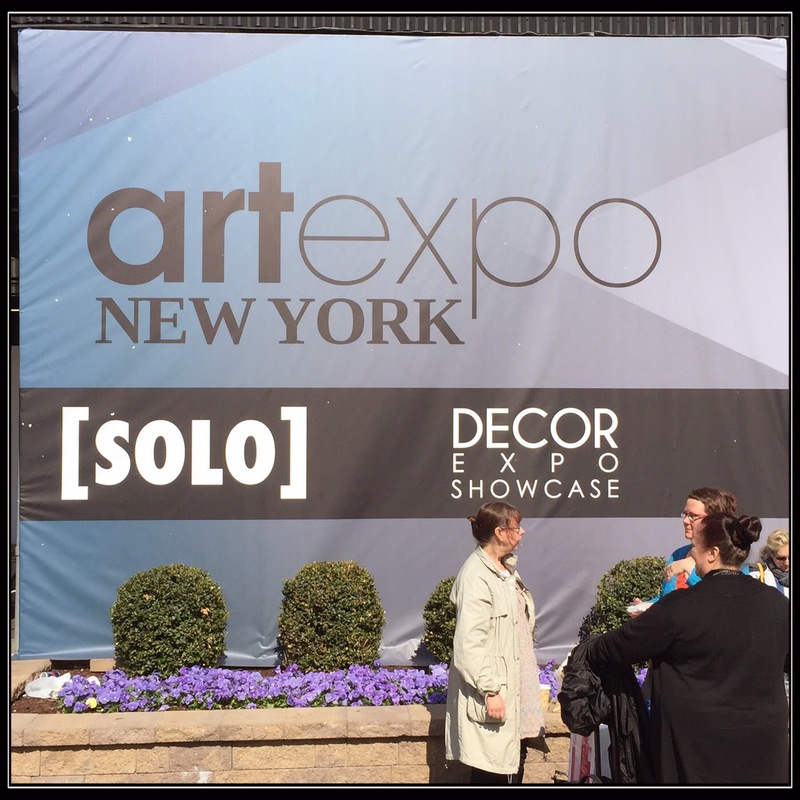 Billed as the largest trade show for artwork, it is opening tomorrow 4/23 and running through Sunday 4/26. 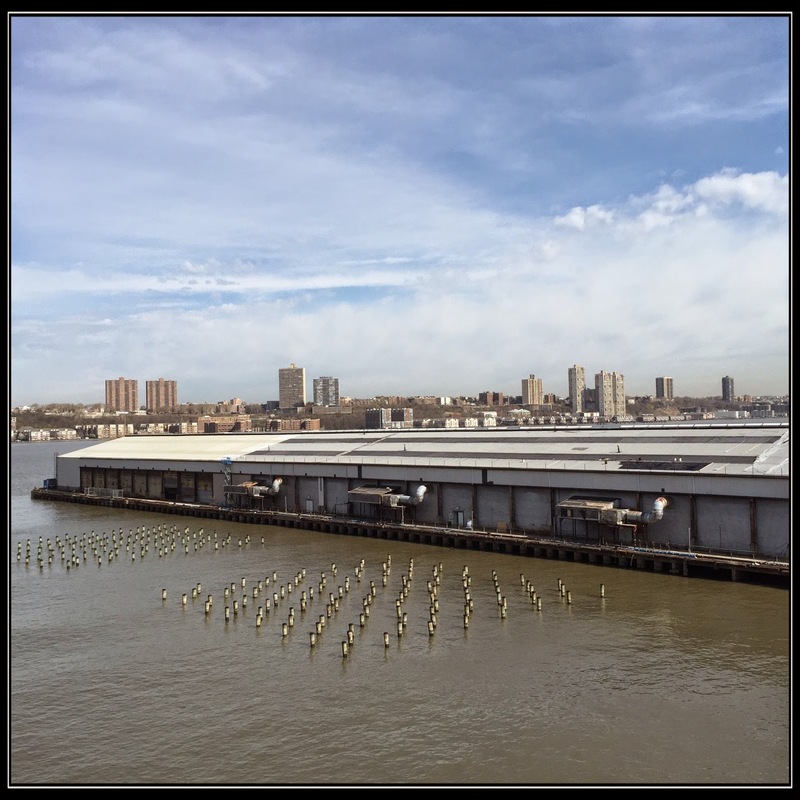 It takes place on Pier 94 on the west side of Manhattan. This is a huge space filled with 400+ exhibitors. 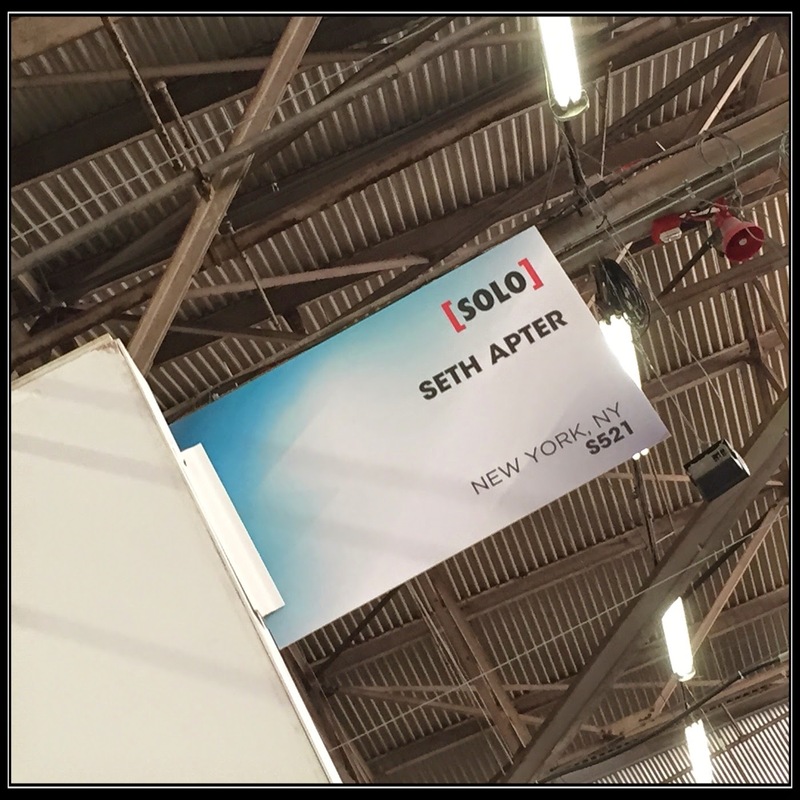 It is always exciting to walk up to your space and see the official sign with your name. It makes the whole experience more real. My booth is 40 square feet and, as I am on a corner, I have the extra side wall that can be seen on the left in this pic as well. After having the walls freshly painted and the lights hung, I started hanging my work. One needs to be part artist, part mathematician and part magician to get this right. Here is my 10 foot back wall. My 4 foot left side wall. And my 4 foot right side wall. No shot yet of the art on the extra side wall. But, thanks to my iPhone 6, here is a panoramic view of the whole booth. Stay tuned for more posts with more shots once the exhibition opens and a post that highlights my artwork join display. Thoughts on social media and creative motivation from Gretchen Miller. 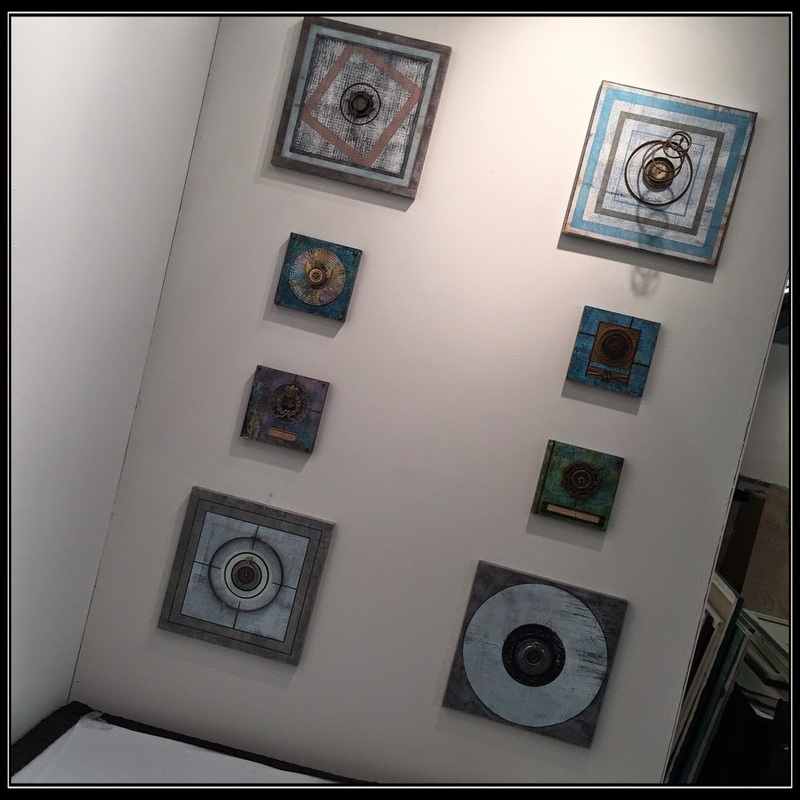 Faux metal surface from Shelly Hickox. I swear it looks real. Yes. These are actually paintings. From Patrick Kramer. 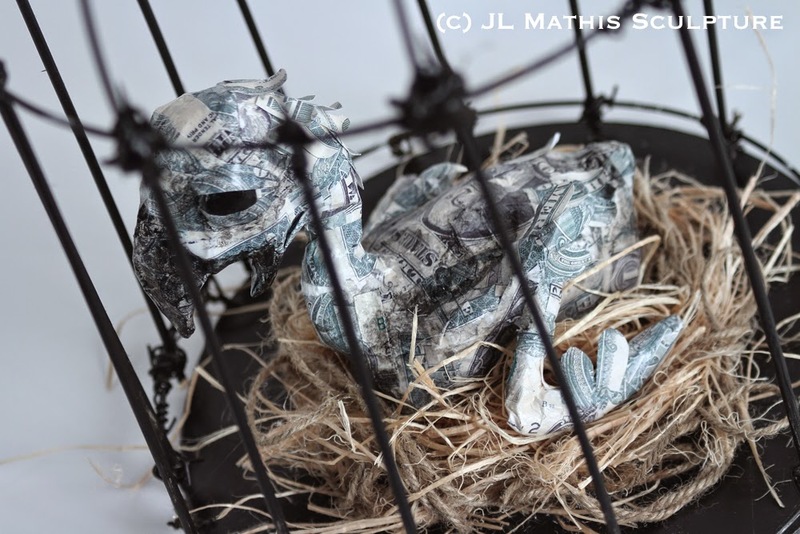 Jodi Ohl reflects on the passion that is necessary to maintain a business as an artist. Near Houston? Rumor has it this installation is a must-see (thanks to Donna Joy for the tip). If I could tell you one thing... Wise words from Paula Bogdan. 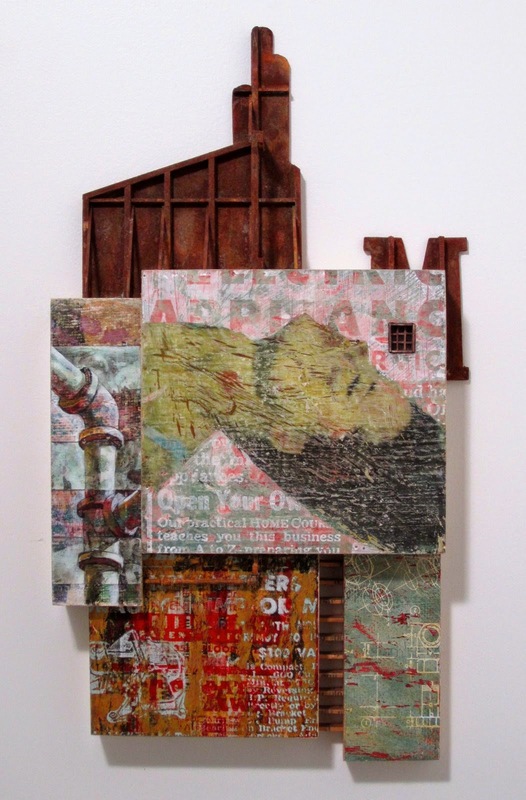 Excited to see that Crystal Neubauer's upcoming book on collage is available for pre-order now. In another life, I might've been a Medici. My husband, Zephren and I had over 30 pieces of our fine art rented by ABC TV studio to be used on the sets of the upcoming show Secret & Lies. They shipped the work back and the work filled our tiny home! 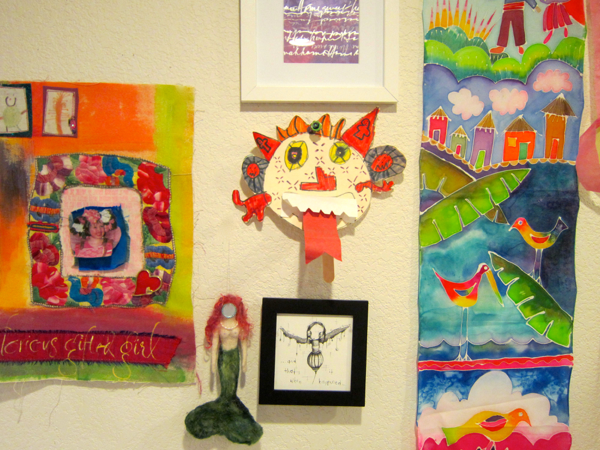 I surround myself with creations by people I know, colorful reminders of my creative tribe. Almost all of my framed artwork is for sale. I keep a changing show in all the rooms in my home and living with this art gives me such great pleasure! I'm a collector and I love to surround myself with discarded, found objects, curating them into interesting vignettes. 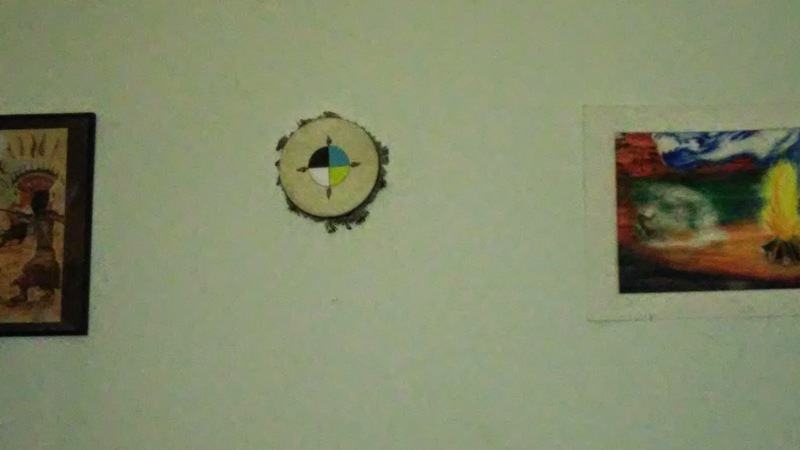 This is a photo of a crib bed spring, which hangs in my den holding some of my favorite castoff items; the art is a self-portrait titled "Becoming Invisible." Last month I had the pleasure of spending the afternoon at Massachusetts College of Art and Design in Boston. 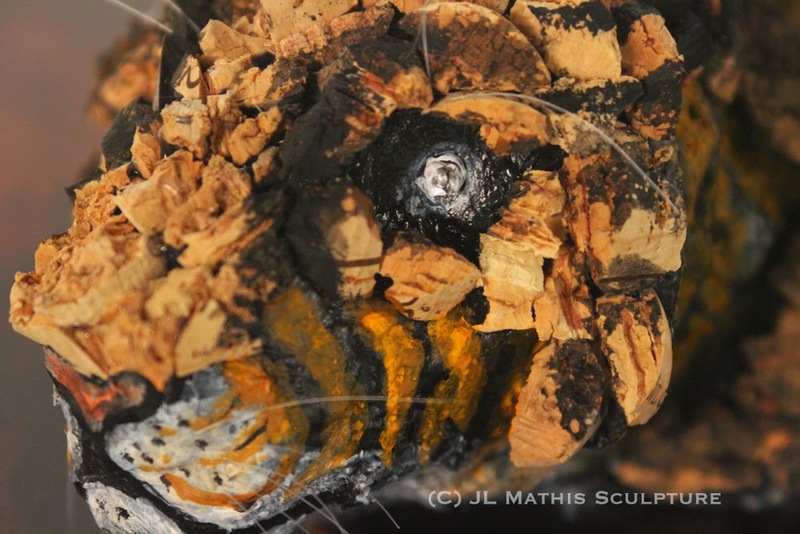 Robert Maloney invited me to be a guest speaker in his Experimental/Mixed Media class that he teaches in the BFA program. I first connected with Bob when I saw his work featured in the May/June 2010 issue of Cloth Paper Scissors magazine. 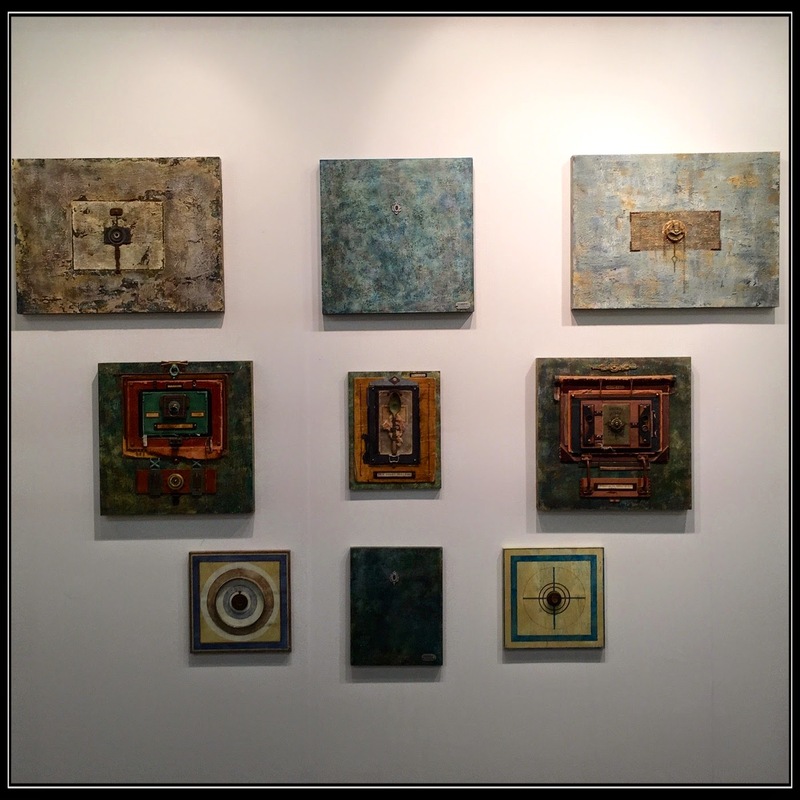 I was immediately taken by his work and asked him to contribute to my book The Pulse of Mixed Media. This piece, as well as several others, are a part of my current exhibition The Pulse Project, running through the month of April 2015 at The Empty Space Project gallery in Putnam, CT. Wish you all could see these in person. The work is stunning...especially in the details. 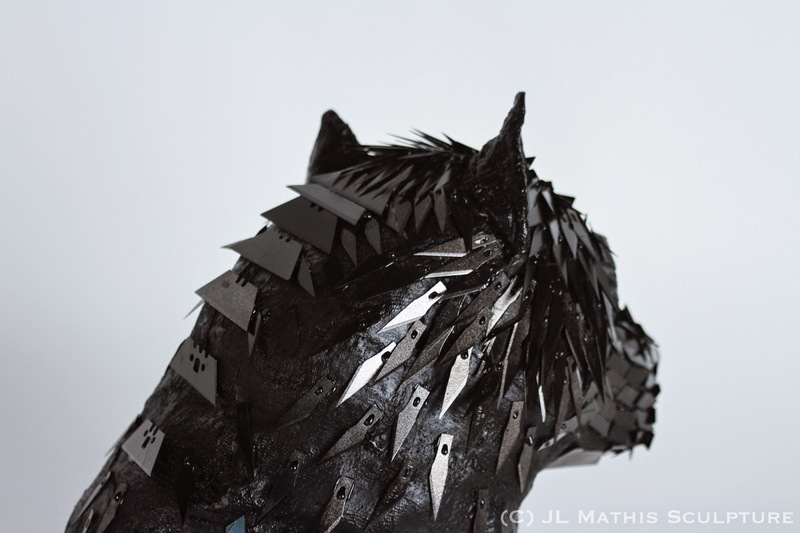 After talking to the class about my experiences as a mixed media artist, I had a conversation with one of the students, JL Mathis. I had the opportunity to see her work in person and was quite impressed. 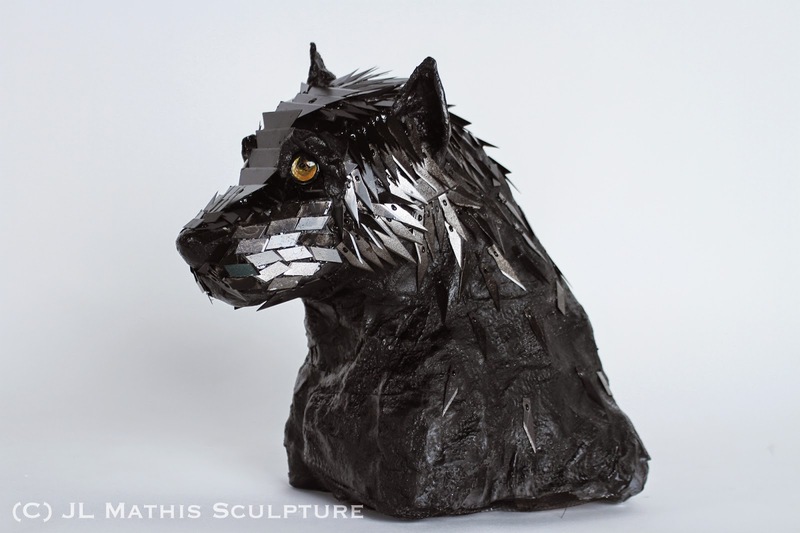 A sculpture who works with recycled materials, each of her pieces is quite unique and directly connected to her concerns about the plight of different animal species. 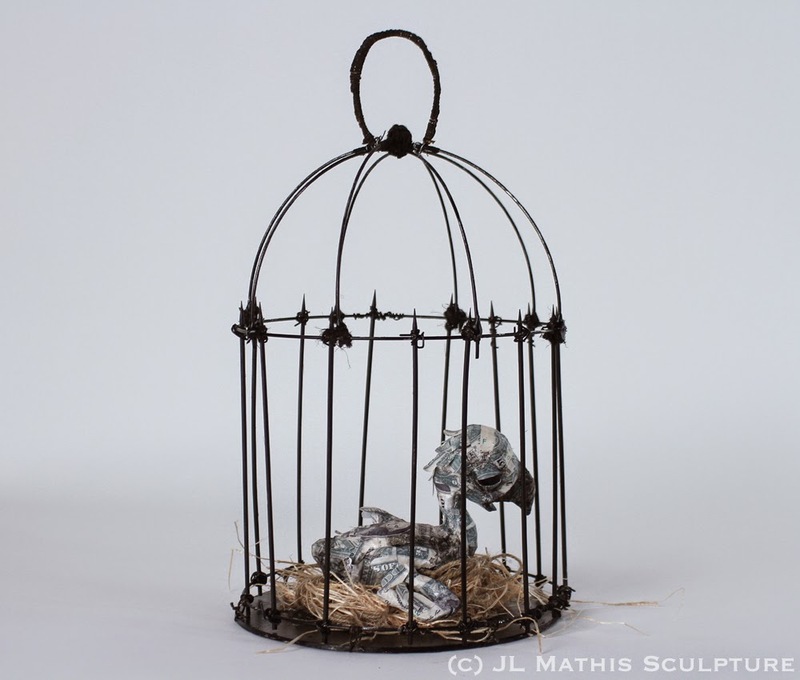 Her use of materials that are specific to the issues behind each piece is inspired and you can read more about each one on her website.